People gathered in the central square of Afrin in northern Syria waving Syrian government flags after the arrival in the city of pro-regime militia, according to a video published by Russian news service RT. The footage showed dozens of people climbing on cars and monuments hoisting portraits of Syrian President Bashar Assad as a larger crowd watched on, RT reported. The Syria-backed forces reportedly arrived in Afrin this week to help people there defend the area against a Turkish incursion that began on Jan. 20. Turkish President Recep Tayyip Erdoğan has said militia attempting to enter Afrin will be repelled. Turkey’s military earlier on Friday published a video showing Turkish forces bombing a convoy of 30 to 40 vehicles attempting to enter Afrin the previous night. The Syrian government also reported a Turkish attack on an aid convoy the same day. Turkey launched the incursion into Afrin a month ago to battle Kurdish forces it says are indistinguishable from the Kurdistan Workers’ Party (PKK), a group fighting for autonomy for the Kurds in Turkey that is recognised as a terrorist group by the United States and European Union. 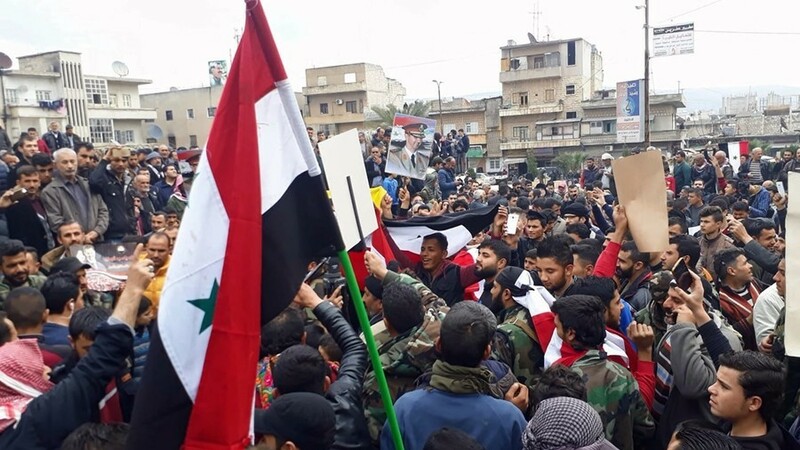 Demonstrators waved Syrian flags in the central square of the Kurdish-dominated city of Afrin, as Damascus sent militias to reinforce locals in their resistance against the Turkish onslaught.